The best of Intel’s efforts in the SSD industry is observed in the 520-Series SSD, which was the best SSD build using the LSI SandForce SF-2281 controller. For the consumer SSD market, Intel chose a two tier approach just like other SSD manufacturers. The 520 Series holds the top spot, even today, with 25nm ONFi synchronous 5K P/E flash. The value or mainstream SSD product was the 330 Series. The 330 Series also used 25nm ONFi synchronous flash, but with 3K P/E cycles. 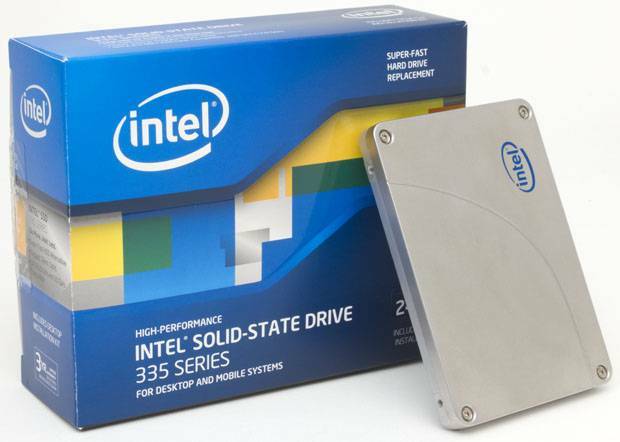 The 330 is out and the new 335 SSD takes over as the mainstream SSD offering for Intel. As the name already suggests, the 335 is not a major upgrade over the 330. Intel usually reserves XX0 product names for bigger upgrades, such as the SSD 520 update where Intel moved to SandForce from a Marvell controller that was used in the SSD 510. The more minor updates (usually NAND die shrinks) only change the last number of the model. In other words, SSD 335 is essentially the SSD 330 but with 20nm MLC NAND instead of 25nm MLC NAND. There are minor changes in performance that are mainly positive, but 20nm NAND is really the only new thing that the SSD 335 brings, which gives it the advantage of being with efficient power usage. It uses close to 1/3 the power to be exact. (850mW compared to ~300mW). The 330 ended up being a very competitive value drive, and from a performance standpoint it looks like the 335 is poised to carry the torch forward. Intel hasn’t really made any great strides with the SandForce controller, but the 20nm NAND has given it a bit more of a competitive edge on incompressible data front. The price of this drive is $197.06 on Amazon.com as of the time of writing this post. Click Here to visit its page there.